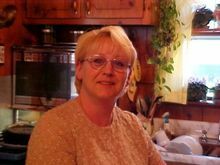 Robin Bivens Harris, 58, of Emporia passed away on Saturday March 2, 2019. She is the daughter of the late Wendell and Emily Britt Bivens. Robin is preceded in death by her brother, Wendell Bivens, Jr. She is survived by her loving husband of 37 years, George Harris; her daughter, Nicole Tarzwell (Kenneth); grandchildren, Vladimir Clark, Dean Tarzwell; sisters, Cathy Davis, Tammy Gibbs and several nieces and cousins. The family will receive friends on Saturday March 16, 2019 from 1:00 p.m. to 2:00 p.m.at Memorial Funeral Home & Crematory, 214 N. 6th Ave in Hopewell. Robin's memorial service will follow at 2:00 p.m. in the funeral home. Interment will be private. Add Photos, Videos, Music that tell the story of Robin's life.